We talk to the centre's director and exhibiting artists, and find out what's being shown – and made – at the centre. “The entire British glass community is descending on us this weekend,” says James Bustard, Director of Sunderland’s National Glass Centre, which reopens to the public on Saturday after a £2.25 million redevelopment. Made possible by grants from Arts Council England, the Heritage Lottery Fund, the Sir James Knott Trust and the Foyle Foundation, the centre’s parent institution, the University of Sunderland – who took over the running of the centre in 2010 – has also invested £975,000 in the project. The Glass Centre, which originally opened in 1998, houses some 30 research students, several of which will be displaying their practice-based Phd research alongside the work of high profile artists. “We’re showing the work of about 40 glass artists and the cream of British studio glass art,” says Bustard. Five dedicated exhibition spaces will display historical and contemporary innovations in the studio glass art form, a movement that transformed glass from something that was either utilitarian or decorative into a contemporary artistic medium. European studio glass art pioneer Erwin Eisch will have a dedicated exhibition, and 75 works loaned by National Museums Scotland from the bequeathed collection of British studio glass champions Dan Klein and Alan J Poole will be on display for a year. As part of its mission to push the boundaries of glass art, the centre also hosts a residency for artists whose practice does not normally involve glass. Bustard explains that the artists take on the role of designer while “we translate and facilitate their ideas.” Bruce McLean is one of four artists from this residency programme who will be showing new work in one of six display cases that have been embedded within the fat wall of the Long Gallery. He has been working with National Glass Centre teacher James Maskrey to create three glass heads. Alongside McLean’s work, three other artists who don’t work predominantly with glass will be displaying new pieces created during their residency at the centre. Ceramicist Richard Slee has been facilitated to translate his humorous signature style into glass objects, creating an épée fencing sword, a net for catching butterflies, and quirky old-fashioned torch lights. 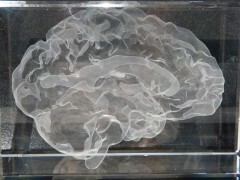 Katharine Dowson, meanwhile, has made glass casts of her own brain and a heart. 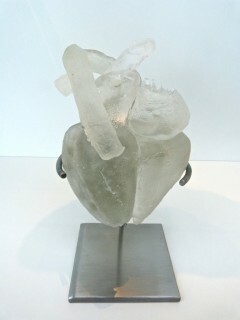 Though not specifically a glass artist, the sculptor has a history of using glass within her work. “There’s a timeless quality to glass,” she says. “From something as simple as sand, you can produce amazing colours and hues.” She uses glass to convey specific concepts that link art, science and spirituality. “It’s the membrane quality, the way it’s so hard and so fragile,” she explains. Dowson has been travelling up and down from London to Sunderland over the last five weeks to intensively prepare her work. She has cast the heart and brain from an MRI scan. Since 2002, Dowson has been working to find ways to link up 3D printing software with this medical technology. She has worked with six programmers and scientists to develop a programme that will be readable for 3D printing and laser etching. 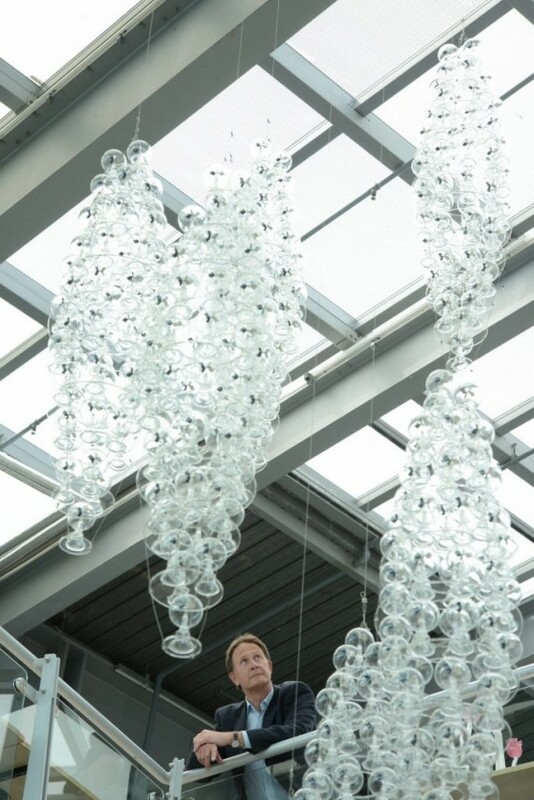 Central to the National Glass Centre is the notion of ambition and exploring the boundaries and histories of glass – to the extent that feted Dutch designer Gijs Bakker’s work has been delayed in order to allow for its technical complexity to be fully mastered. 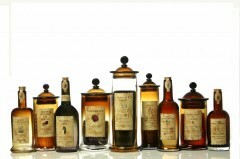 A temporary replacement, however, was close to hand in the form of work by Maskrey. Proof, surely, that while glass production on an industrial scale no longer has a place in Sunderland’s economy, the National Glass Centre is playing a crucial role in keeping glass making a relevant and evolving skill for contemporary makers and artists.